A professional grade brush of flat, narrow vegan bristles with a angled head. Applies powder eyeliner or eyebrow powder in a fine or diffuse line. 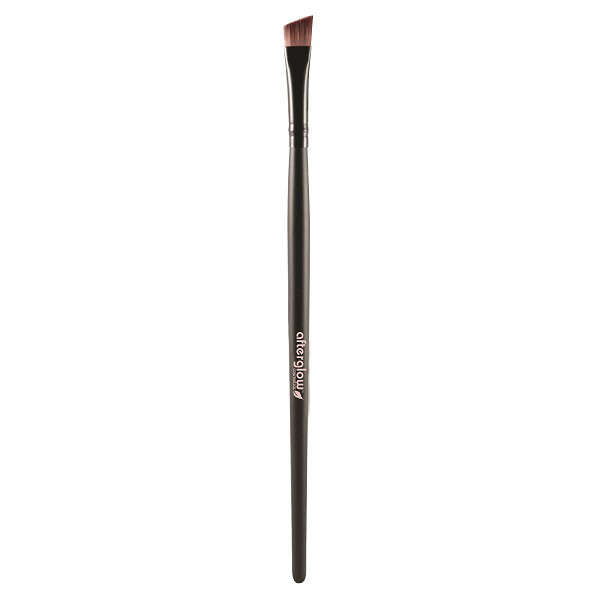 Dip the angled liner brush into the eyeliner or eyebrow powder and then tap off any excess. Use feathery rather than long strokes at the lash line or eyebrow to achieve the most natural look. Brush: Hand-tied taklon bristles (synthetic)with metal ferrule and wooden handle. These brushes can be easily cleaned with shampoo or a gentle soap to keep them disinfected and avoid makeup and bacteria buildup. This can help prevent common skin issues like acne and skin irritation. It is recommend to disinfect your brushes every few days and wash them every week. Afterglow Cosmetics offers a lifetime guarantee on their vegan cosmetic brushes.